MSU Texas Roundup: Women upset West Texas A&M, Men fall. 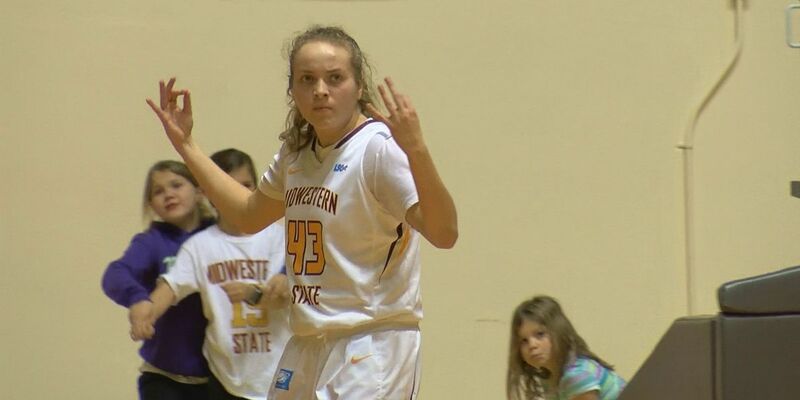 Midwestern State's Liz Cathcart throws up a 3 after hitting a clutch triple late in upset over West Texas A&M. Midwestern State locked down 14th-ranked West Texas A&M in the fourth quarter to knock off the Lady Buffs, 66-61, on Thursday at D.L. Ligon Coliseum for its biggest win of the season. The Mustangs completed the upset by holding a hot-shooting WT team without a field goal for the final 2:38 and just one attempt – a last second heave at the buzzer – down the stretch. MSU Texas forced WT into a season-high 24 turnovers and held them to a season-low 61 points to snap an 11-game losing streak to the Lady Buffs. After getting burned from the long ball in the first meeting, the Mustangs kept WT to just one made 3-point field goal in the contest (1-for-9). Senior Chelcie Kizart powered a methodical MSU Texas offense with 15 points, her third-straight game in double figures, on 5-of-9 shooting. The St. Paul, Minn., native poured in 10 in the second half to give the Maroon and Gold their second upset victory of the season. Junior Liz Cathcart added 11 points, knocking down a key 3-pointer with 2:21 remaining to put the Mustangs on top for good. After playing to a dead-heat through the first 37 minutes, MSU Texas flexed its muscle defensively and converted on all six fourth quarter free throws to pull off the upset. Cathcart staked the Maroon and Gold the lead by knocking down a triple from the top of the key with 2:21 to play before the Mustangs forced turnovers on four-straight WT possessions. Megan Gamble turned the ball over on back-to-back possessions and Tyesha Taylor was called for an offensive foul. Junior Annette Dukes extended the lead to three, 62-59, on a layup from the right block with 48 seconds remaining. Sophomore Kityana Diaz made one of the biggest plays of the night, poking the ball free and pouncing on the loose ball with 14 seconds to go to send MSU Texas to the free throw line to ice the game. Deleyah Harris recorded a game-high 18 on 7-of-12 shooting while Taylor added 11.